With MacOS Sierra now available, Mac users can now get Siri on their computers, have improved iCloud integration, unlock their Macs with an Apple Watch, use Apple Pay on the web, and much more. Before you go diving right into updating to macOS 10.12 though, you should take a few precautionary steps to prepare for the software update. 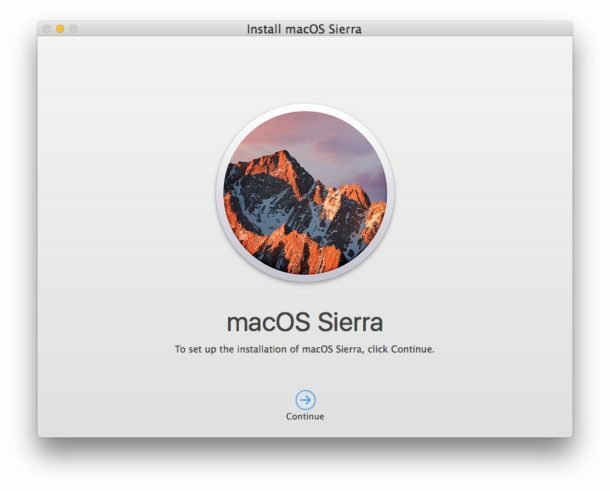 We’ll walk through some simple steps to prepare for updating to macOS Sierra so that you can install the new Mac OS system software with ease. Is your Mac supported by macOS Sierra? If it’s relatively new and built in the middle of 2010 onward, the answer is probably yes, but you’ll want to be sure by viewing the macOS Sierra compatibility list first. Most apps that are compatible with El Capitan are compatible with Sierra as well, just be sure you update your apps after you install macOS Sierra. If you have any mission critical apps, you may want to reach out to the developer to investigate if a particular application has any issues or not. No matter what system software you update, you always should backup first. Don’t skip making a complete and thorough backup of your Mac before installing MacOS Sierra. Setting up Time Machine on a Mac is easy and allows for simple backups and restoring in the odd event something goes haywire. Don’t skip a backup, it’s important. Typically a macOS Sierra installation takes a bit over an hour, but it can vary depending on computer speed, what version is being updated, and how much stuff is on the Mac. When it’s finished installing, the Mac will reboot itself into macOS 10.12 Sierra, ready to go and enjoy. 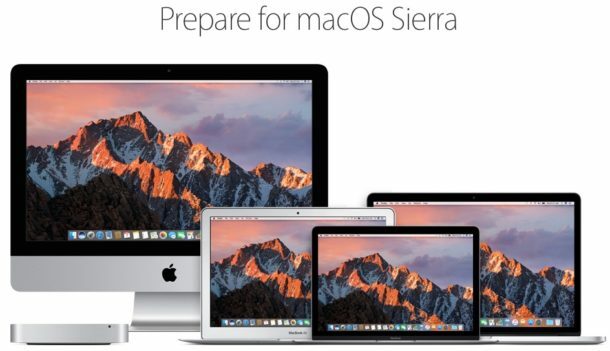 Are you prepared for Sierra? Did you jump right into the update? Do you have any thoughts on installing macOS Sierra? Let us know in the comments! I’ve not had a need, ever. If I did I can use my iPhone or my iPad. It would take my windows machine a couple of hours to boot up, catchup 30000 updates and 10 reboots before I could get on the net. Or another Mac that is NOT updated! OK I successfully installed macOS Sierra, it was largely event free. I backed up to Time Machine first. But when I first booted into Sierra, no apps worked. When I first went into macOS Sierra, I couldn’t launch any apps at all, they would just bounce in the Dock repeatedly or they would not do anything at all. I had to hard reboot my Mac, and it took longer to boot up then usual, but then it worked fine. Crossing fingers it’s gravy from here… always nerve racking to update system…. At least this update didn’t brick any macs like iOS 10 bricked some iphones and ipads. I personally plan to wait a few days and see if there are any issues or problems with Sierra, I used to be able trust Apple in that their updates and upgrades were rock solid and rigorously tested to ensure no problems, the last few years they have sorely been lacking in quality assurance of their software! yeah, look what happened with iOS 10. A number of people ended up with broken devices after trying to update on the day it launched. I have installed Sierra and immediately regret it. The computer has been unresponsive and crashes 2 times since installing the update, apps won’t open sometimes, Safari freezes up and stops working completely, reboots are slower. This is a terrible operating system release so far. I’m sure not everyone will have my experience, but if you need to actually work, avoid Sierra. I should have stayed on El Capitan 10.11.6 which worked fine. Now I get to spend my free time troubleshooting computer problems, what a complete joke. Beyond frustrating. Yes but now you have Siri. I don’t see anything in this update to make me want to change. I’m still gun shy after getting boned with El Crapitan and finding it broke a lot of things including AirDrop. At least it didn’t brick any devices like iOS 10 did (not any of mine luckily). My multiple uploads of the Beta left me without gestures on my MBPro. It makes no sense to have six desktops open if I can’t swipe between them. I couldn’t report it to Apple b/c I restored and had nothing of value to send them other than my experience, i.e., no data files. I’m backing up now and will report back later either way. Hey, John. I’m Ken for Malaysia. After reading your review about the new macOS SIERRA. I’ve started to worry about upgrading it. Sincerely, may I have your advice about this. Because you have experience it. Your thought might help throughout my day. If El Capitan works stable for you, stay on El Capitan. Sierra has given me headaches with crashes and weird behavior, nothing I have seen on a Mac before, I also sometimes get the apps won’t launch thing and sometimes Safari freezes up and won’t load webpages without force quitting and relaunching. Maybe try macOS 10.12.1 when the first bug patch comes out. I am considering a downgrade back to 10.11.6 personally. Yes! This! Apart from the usual opening day slow-downs, this is my biggest problem with the update so far. It used to be so smooth. Does anyone have any ideas on how to report this? first truly worthless update from apple. I agree. Considering it took me twelve hours to restore a 70GB Time Machine backup from a Time Capsule over “Gigabit Ethernet” after the Sierra install failed to the SSD. Sierra installation completely hosed my system. On my way to dell.com to buy a RELIABLE computer with an intrusive OS from M$. With just over 60 Dell laptops to support, there are few issues at my day job. After 25+ years, my Mac love affair is over. Apple doesn’t give a crap about the Mac any more, and this OS release shows it. FU Apple, you certainly have shown me phones, watches, cars, and other “in” gadgets are where your focus is. This isn’t a “would never happen if Steve was alive” rant, but it’s clear that Apple has pushed past the legacy MacOS and is driving head-first into the future, which apparently does not include a decent, reliable, stable desktop OS. And even where the focus is, the quality isn’t what it should be. Several people got their phones and tablets bricked when trying to install iOS 10 the day it was released, just a week ago. So for those iOS users it was actually as bad or maybe worse than for mac users. Not to mention those who got their 12.9″ ipad pros bricked and required a computer and itunes to fix them (the larger ipad pro was advertised as a cheaper substitute for a computer). my advice is don’t let apple use you as a guinea pig. wait at least 6 months until they get the thousands of bugs out. you’ll survive the wait for useless Siri, which has not worked very well since it came out. apple reminds me of slick doods who promise you anything in order to entice you with nothing. don’t fall for their madison avenue propaganda. Best advice here Chance, Apple does exactly that, don’t believe me look at the endless sites that show how to fix this and that in Sienna. Apple uses the public rollout as beta test, Sienna like many OSX releases before it is ridden with bugs and glitches. The best way to prepare for Sienna upgrade is to NOT UPGRADE TO SIENNA!!! El Crapitan is a decently stable OS, Sienna offers no significant improvements unless you need the teenage candy. El Crapitan will remain supported for a few years, by then Apple’s sucker public will have gotten the bugs found and fixed in Sienna. Then, and ONLY THEN should anyone update to Sienna. I’d like to add another step before updating: Deactivate disk tools like Jettison (St.Clair Software). They eject the installer disk image when Sierra reboots, preventing it to install. I usually like to copy the update app to an external drive so that I can use that one to update other machines. I buyed used macbook pro and after viewing some old files inside that mac i wanted to factory reset it .So i turned off then erased macintosh hd drive and then wanted to reinstall macos x but sth went wrong and i turned it off.After that i powered it and took long to repair itself from internet and now it can’t install macos because messages pops ups and says you cant update your mac because file is damaged.there is only utility windows thing . Yes get a bootable installer drive and reinstall Mac OS from that. That is your best solution if internet recovery does not work. Keep CMD-R pressed while starting your MacBook till the Apple logo appears to boot into the Recovery Partition. You will see the OS X Utilities. Select Disk Utility and erase the Macintosh HD partition. This should install the last OS that was installed on your MacBook. I’ve been running Sierra for 3 days now and it’s the most problematic Mac OS software I’ve ever used. Everything is broken, or everything starts breaking in a few hours. I have to restart 2-3 times a day. This is ridiculous. I give Sierra an F- it is very low qualiyt. Keep your documents, photos, etc on your one drive, google drive or dropbox account in the cloud – or an external drive. The only thing that should be stored on your mac is the mac software. You can also store your iTunes library, iPhotos, etc on an external HD or apple drive. Then you never need to freak about a backup. I always install fresh, nuking the whole dang thing. The mac HD fills up so fast, that keeping important files on the mac HD is a very high risk as when the HD crashes, you are out of luck. Plus, timemachine sux… Life is too short for Time Machine. If you really, really, really insist on a backup, get rsync to work with mac. Did I mention time machine six…? I started the download yesterday evening (mistake n1) and let it run overnight. Today I can’t access it at all. I have re started rebooted attempted starting it on recovery mode and nothing works . I get to enter my password then tells me that my laptop’s session was interrupted due to an error, tells me to press any key (done it thousand times have no keys left …) and keeps taking me back to username password step just to take me through the same thing over and over again!! Exhausted with this, has anyone else had this same problem? Any helpful suggestions ? I’ve recently updated my MacBook Pro to Sierra. Because I didn’t take the “Tour” straight away the popup has disappeared from my screen. I recall the popup mentioning that I could view the “tour” later but can’t recall where to find it. I’ve searched my MacBook and can’t find it, searched the internet for a hint as to where to find it, to no avail. I was wondering if anyone on this site may know.